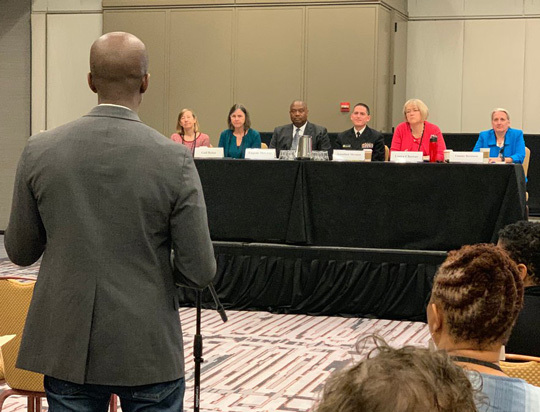 Stakeholders shared more input on the next iterations of the national HIV and viral hepatitis strategies and the development of a federal sexually transmitted disease (STD) plan during the CDC’s National HIV Prevention Conference in Atlanta in March. This was the 18th listening session convened to gather input on the next iterations of the national HIV and viral hepatitis strategies. Leaders from CDC’s National Center for HIV/AIDS, Viral Hepatitis, STD, and TB Prevention as well its Divisions of HIV/AIDS Prevention, Viral Hepatitis, and STD Prevention, HRSA’s HIV/AIDS Bureau, and the HHS Office of HIV/AIDS and Infectious Disease Policy engaged with more than 80 stakeholders who attended. We received oral and written comments from a variety of individuals who shared recommendations, concerns, and questions about a broad variety of topics. Highlighted below are cross-cutting comments as well as input on each of the three topics currently under consideration. Support navigators for HIV-negative clients. Identify innovative uses of social media and web-based tools to reach and engage young people. Hold health centers accountable for providing HIV services. Educate non-specialist providers to expand access to hepatitis C virus (HCV) treatment. Strengthen HCV screening and treatment efforts in corrections. Focus on most prevalent STDs. Support STD services provided outside health department settings. Include increasing the STD capacity of other health systems such as maternal and child health, school health, and substance use prevention and treatment. Improve and expand provider training in sexual health to expand access to services and reduce stigma around those services. Leverage opportunities for self-collection of samples and home testing. Support and incentivize provider and system innovation to improve services. Incorporate complementary/aligned roles for other sectors to engage all of society. Use creative communications approaches to reach key youth audiences. Develop new prevention tools and treatments. Provide more pre-professional medical education on sexual health to improve provider knowledge, competence, and comfort. Support structural and policy changes to address social determinants of health and disparities. Educate and engage faith communities. Incentivize clinics to offer expanded access hours making services more accessible to those who need them. We are grateful for the thoughtful input received from the diverse audience. We heard suggestions from people living with HIV, health care providers, health department leaders, advocates, representatives of community-based organizations, and more. The stakeholders who offered input hailed from Puerto Rico to Alaska, and many communities in between. In collaboration with our federal partners, we are now analyzing the input collected at all of the listening sessions and that we received in response to the Request for Information published in the Federal Register earlier this year. This input will inform the development of the next iterations of the national HIV and viral hepatitis strategies and the new federal STD plan.